The 2001 Drum Corps International World Championships headed to Ralph Wilson Stadium in Orchard Park, New York, just outside of Buffalo. 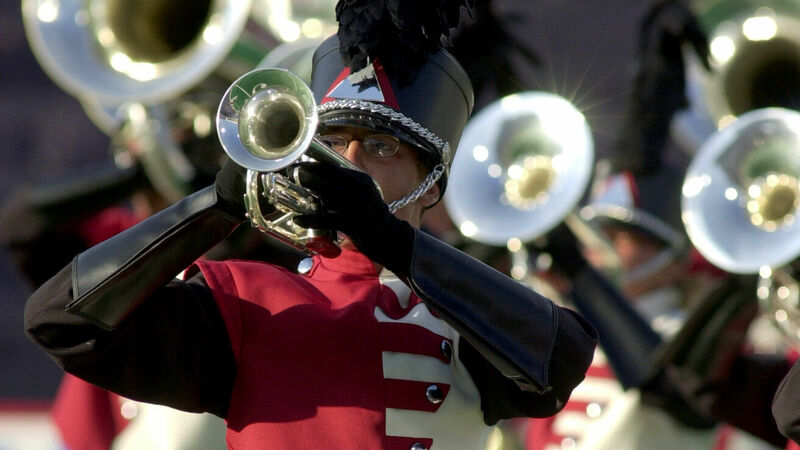 Previous events included the 1995 and 1990 DCI Finals. 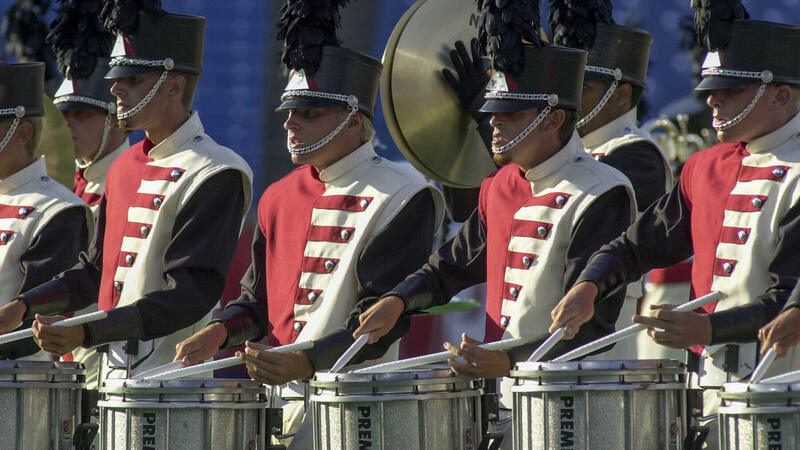 Santa Clara Vanguard finished fourth with a look at people going to work and finally cutting loose at night, and Glassmen finished fifth for the third time in four years. Colts finished as a finalist corps in 12th place with its show titled “Chivalry.” It was a medieval period themed production that explored the qualities expected of a knight. These qualities included the lofty ideals of courage, honor, loyalty, and consideration for others. Watts wrote the lyrics in 1715 after receiving notice that his wife and children perished due to the sinking of a passenger ship during an Atlantic storm. Holsinger was inspired to use the piece as a metaphor for the recovery of the Plainfield community because of lyrics from the final verse of the hymn: “And clouds arise, and tempests blow...” In Colts’ show, the piece represented the self-sacrificing concept of chivalry. The corps started its performance with groups of four members of the horn line rapidly pivoting around a single flag bearer within a large block diamond form. The color guard members wore costumes of muted browns and black, each the same as the other, but seemingly tattered as if by battle. Flags were of solid shades of muted orange and yellow. A company front advancing on a diagonal visually highlighted the emotional climax of the piece. This led into a reprise of the main fanfare melody, ending with a triangular block of brass players and a single line of drums surrounded by a heart shape of flags. The next segment of the show was “Allemande,” the sixth movement from Ron Nelson’s “Courtly Airs and Dances,” written in 1995. An Allemande is a stately German Renaissance dance from the early 1500s, used during processions. Such dances emphasized strong rhythmic patterns to encourage dancing. The piece created a festive medieval mood, accompanied by flags of subdued shades of blue. But just over a minute into the carefree dance, the ending suddenly turned dark as the piece transitioned into “Battle Scene,” an original percussion feature written by corps staff members Mark Smith and Ryan Thomas. Members of the horn line and color guard engaged in mock battle amidst the presence of battle shields. The first piece titled “Non Nobis Domine” is Latin for “Not unto us, O Lord,” and comes from the short prayer of thanksgiving found in Psalm 115:1, which in the King James Version of the Holy Bible goes on to state, “but to thy name give the glory.” In the movie, the piece was sung after Henry V’s great victory at the Battle of Agincourt in 1415, part of the Hundred Years War between England and France that was fought on and off between 1337 and 1453. In the Colts’ production, the piece was a ray of hope evolving out of the pandemonium of battle, starting with the melody performed by a single baritone horn, gradually building in intensity. But there was still much suffering on the battlefield. Close-ups of the color guard performers revealed the members fully into the emotional angst of the piece, with faces contorted with grimaces and even tears. Seeing those close-ups is truly gut wrenching. At the end of the piece, the sound of church bells could be heard wafting across the field, offering comfort to the bereaved. The final selection from “Henry V” was “Once More Unto the Breach,” based on King Henry’s speech encouraging his troops to again attack French defenses, to not give up and to try, try again. It is believed Shakespeare regarded the speech as a metaphor for never giving up in real life. Colts color guard members’ flags were of regal varieties of blues and purple during this segment. A reprise of the main melody of “Sinfonia Voci” brought the show home, ending with the brass players in a straight line at the very front of the stadium. Performers stuck their arms straight out toward the audience in a show of defiance and resolve.